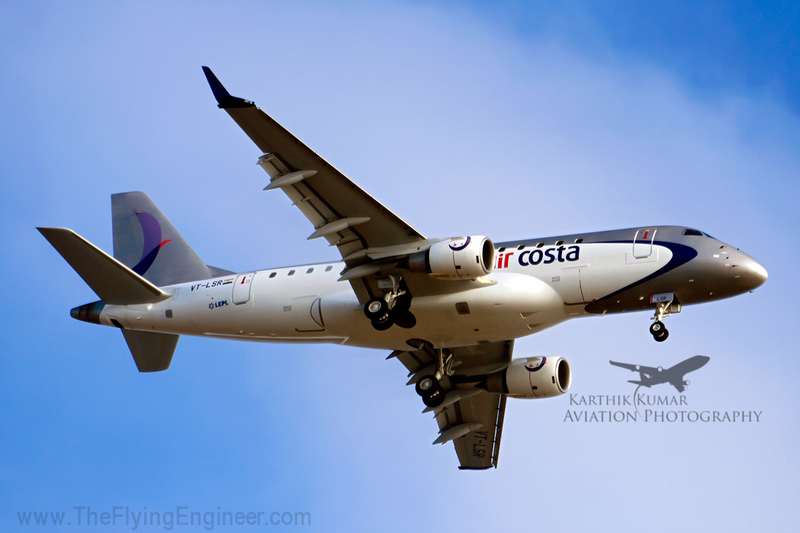 While there may have been numerous mobile-phone camera pictures of Air Costa aircraft in India, here is the first good publicly available shot of an Air Costa Embraer 170 in Indian markings. VT-LSR was caught on lens (JP.net and A.net acceptances pending, AP.net accepted) by the skilled teenager Karthik Kumar , who woke up early on the 18th of October, 2013, to head out to Bangalore International Airport (VOBL), to position himself for a good shot of VT-LSR, manufacturer Serial Number MSN 278, operating as Air Costa 601 (LB 601) into Bangalore from Vijayawada. VT-LSR, an EMB 170AR, was fprmerly registered A9C-MA, operating with Gulf Air. The airplane’s age is about 3 years 7 months, and has been leased from ECC Leasing. ECC Leasing Company Ltd, a 100% subsidiary of Embraer, was established in September 18, 2002 to manage and re-market Embraer´s pre-owned aircraft. Ladies and Gentlemen, presenting to you the Embraer E-170 beautifully adorned in the colors of Air Costa, a regional airline that heralds a new chapter in Indian regional aviation. Click on the image to enjoy the photo in full 1200pix wide – size. Randy Tinseth’s Blog: Details, Spoilt. The header image shows a Boeing 787, which appears to be on a climbout, with the spoilers deployed. It may be an unnecessary fuss, but in the line that he walks on, which is Marketing: details matter, and nothing could be as discomforting as the image of a Boeing 787’s spoilers deployed on a climbout. The Blog (CLICK HERE) is described as, “Randy’s Journal is a place to find the inside stuff about the commercial aviation world.” Surely, and coincidently, the header image is a reflection of the present state of the Boeing 787 program: Adding unnecessary, and dangerous drag on a program that is struggling to climb out into the green. There are many who have an eye for detail, and when they spot the Vice President for Marketing lacking that, it doesn’t speak much (or does it?). Especially an oversight from a man who once was a flight test engineer. Boeing is a good company run by some of the best professionals, producing some of the most innovative and trend-setting products, but I sincerely hope Boeing starts paying more attention to detail in whatever it does, big or small. Cyclone Thane left behind a trail of damage and took with it the lives of around 47 people, when it hit the south-eastern coast of India on the 30th of December, 2011. I downloaded and processed 466 Infra Red Satellite images from the India Meteorological Department, and ran them at a speed of between 5-6 hrs per second. That is, 5 to 6 real-world hours passing in one second of the video. The video has two parts, the first showing the entire section of the earth that is visible to the Met satellite “Kalpana-1”. This part starts at 00:00hrs on the 25th of December, 2011, and runs till 07:00hrs (sunrise) on the 1st of January 2012. 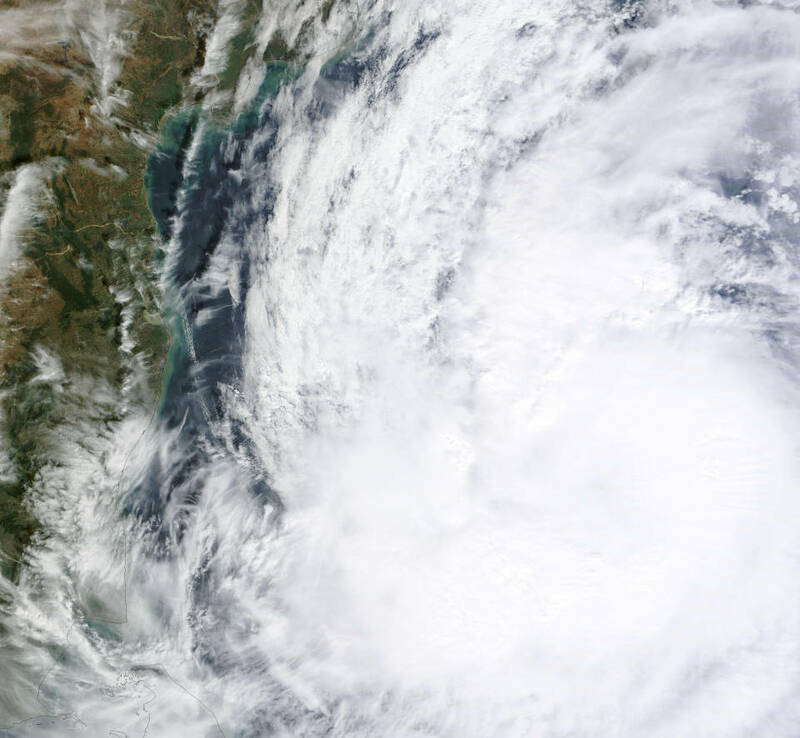 During this period, you will observe the tropical storm Thane developing into a cyclone, hitting the coastline of India on 30th December, and losing energy thereafter, and finally dying over land. You’ll also observe the relative temperatures of the land an sea as the sun passes overhead. This is the basis for land and sea breezes. The second part in the video focuses only on the area covering the Indian Subcontinent.